An interior ministry spokesman said police in the province of Styria acted on a warrant issued in 1989 to arrest him last Friday. He also claimed that Nazi leader Adolf Hitler knew nothing of the Holocaust. 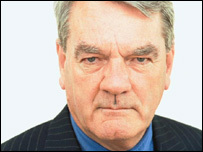 He told a libel hearing in London in 2000 that there had been no gas chambers at the Auschwitz camp. He lost the case and the judge branded him "an active Holocaust denier". A spokesman for the Austrian interior ministry, Rudolf Gollia, told the BBC that Mr Irving was first taken to the town of Graz, but was now in custody in Vienna. Anti-Nazi groups in the UK congratulated the Austrian government. The chairman of the Holocaust Educational Trust, Lord Greville Janner, said he hoped the move would "lead to a successful prosecution". The head of the Holocaust Memorial Day Trust said denial was not a matter of opinion. "Austrian law demands incisive action to protect its citizens from a repeat of the past," he added. Mr Irving was previously arrested in Austria in 1984. This time, the historian was stopped near the town of Hartberg while reportedly on his way to address a students' club in Vienna. Mr Irving came into the spotlight in 2000 when he sued US academic Deborah Lipstadt for describing him as a "Holocaust denier" in her 1994 work Denying the Holocaust: The Growing Assault on Truth and Memory. Giving his verdict, the British judge said Mr Irving was "an active Holocaust denier; that he is anti-Semitic and racist and that he associates with right-wing extremists who promote neo-Nazism".